I’ve come to really appreciate Adagio Teas’ packaging – colourful, resealable, with all the information I need about each tea blend, right on the package. The bag for Raja Oolong Chai is no exception to that. The first thing that I smelled when I opened the bag was the smell of cinnamon. It’s strong and makes its presence known over the ginger and cardamom that I can see in the mix. The blend itself is beautiful, but heavy on the cinnamon. 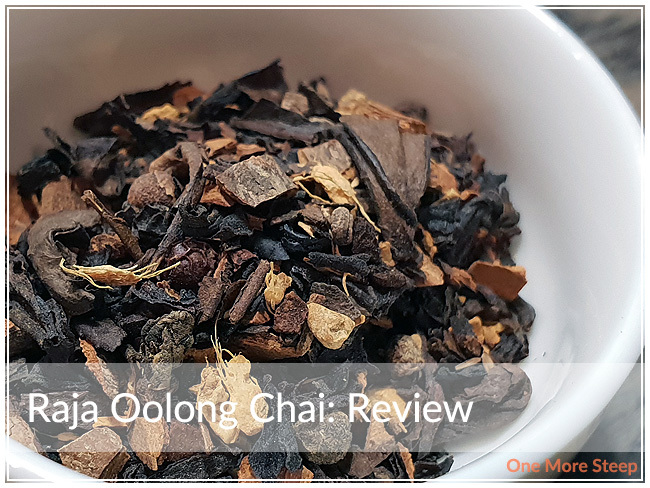 Raja Oolong Chai consists of: oolong tea, cinnamon bark, ginger root, cardamom, chicory, cocoa nibs, natural spicy cinnamon flavour, black peppercorn, and cloves. It’s easy to pick out the ingredients, although I did find that when I first took a scoop, there were no tea leaves! I gave the bag a good shake to redistribute the blend again, and got a more evenly mixed spoonful of tea. Adagio Teas recommends steeping Raja Oolong Chai in 100C (212F) water for 5 minutes. I followed the steeping instructions for my initial steep. 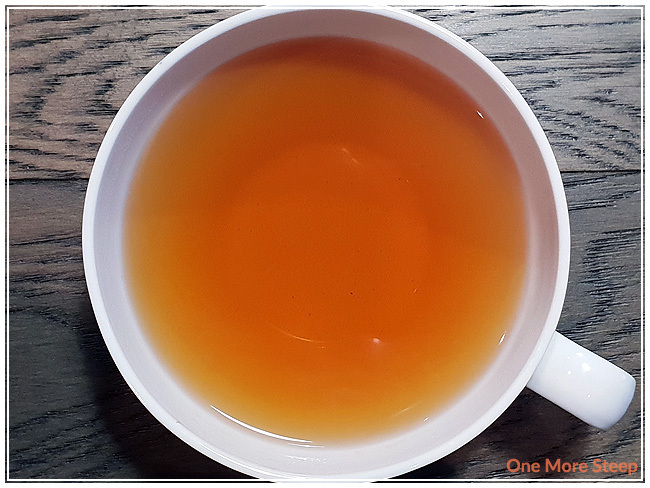 Raja Oolong Chai steeps to a beautiful, deep orange. The aroma is primarily the cinnamon, although I can smell the ginger root as well when I smell the tea. 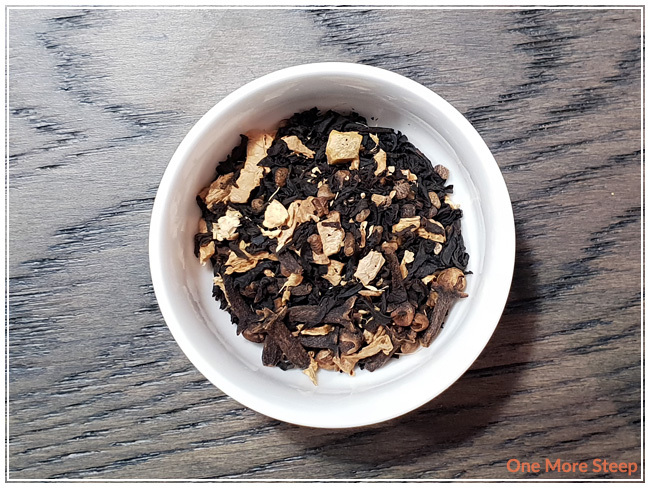 The flavour of the oolong tea blend itself is mostly cinnamon, with some of the warming qualities of ginger and black peppercorn, with a hint of creaminess that I’m attributing to the cocoa nibs. 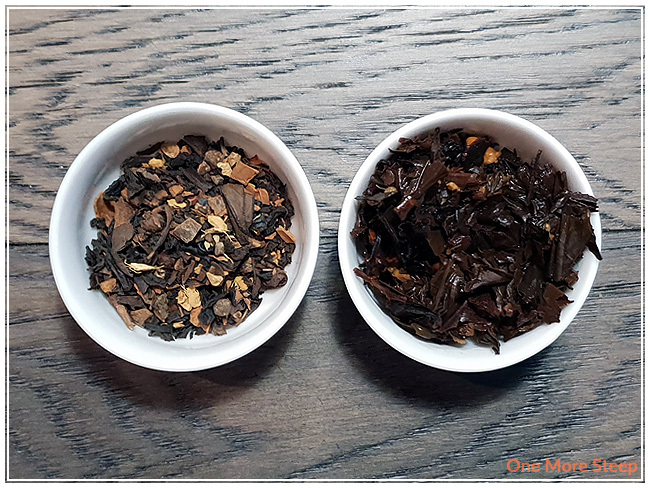 I found that the cinnamon was the strongest and most prevalent flavour in Raja Oolong Chai. 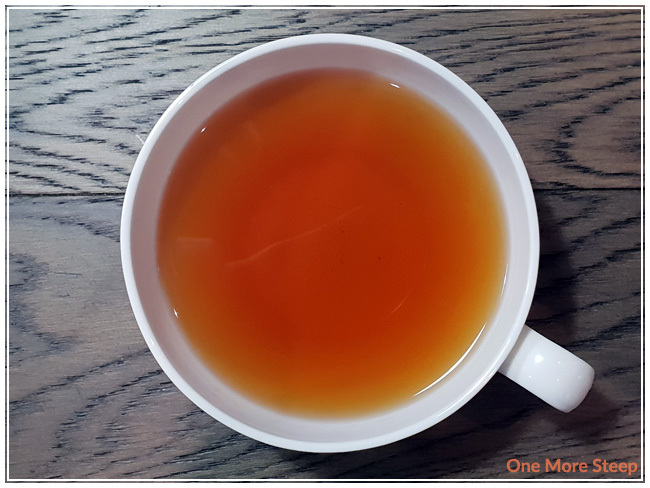 I don’t really taste the oolong base, but it could be adding to the creaminess as well – I do find quite a bit of oolongs have a buttery quality to them. It does play nicely to be doctored – I added some evaporated milk to my cup and found that it helped to temper some of the cinnamon flavour while allowing the other spices to be more noticed. I resteeped Raja Oolong Chai, and found it to be weak compared to the initial steep. I would say that Raja Oolong Chai is good for just one steep. 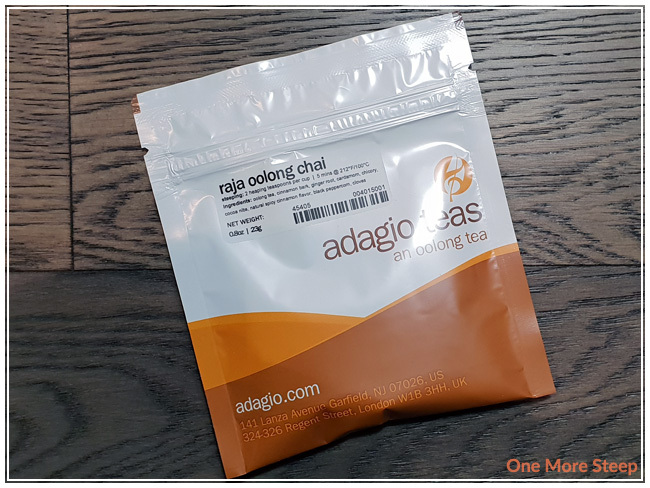 I thought that Adagio Teas’ Raja Oolong Chai was just okay. 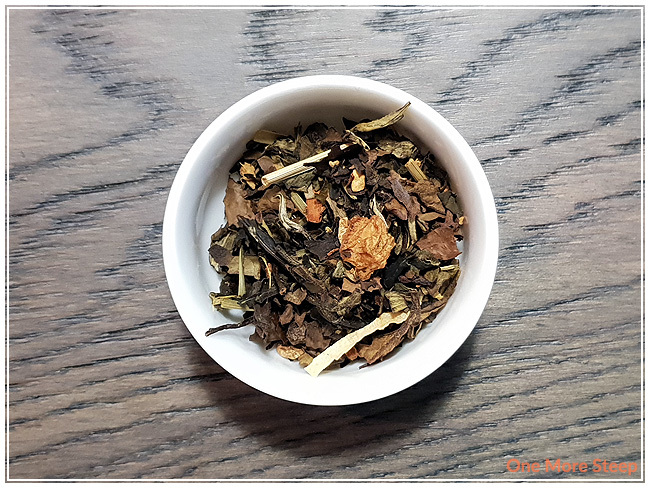 I found this tea to be very heavy on the cinnamon – which is great if you’re a big fan of cinnamon flavours. 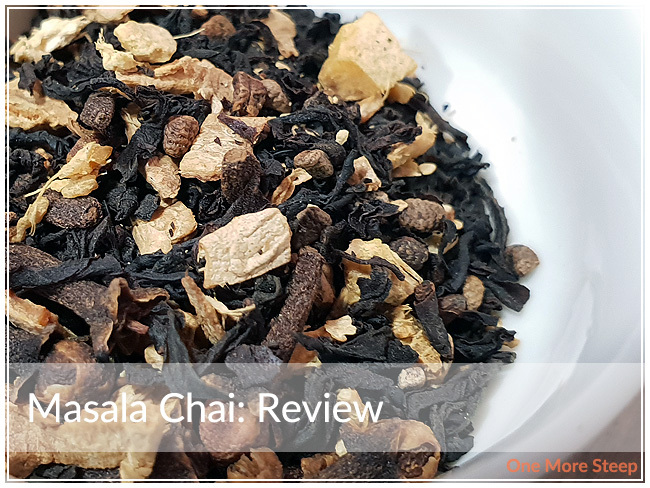 I was hoping for a more balanced spice flavour profile from this chai, and I think it could be accomplished with a bit less cinnamon bark or less of the cinnamon flavouring. This does work well with milk, so I think there is potential if you’re a fan of a chai latte. 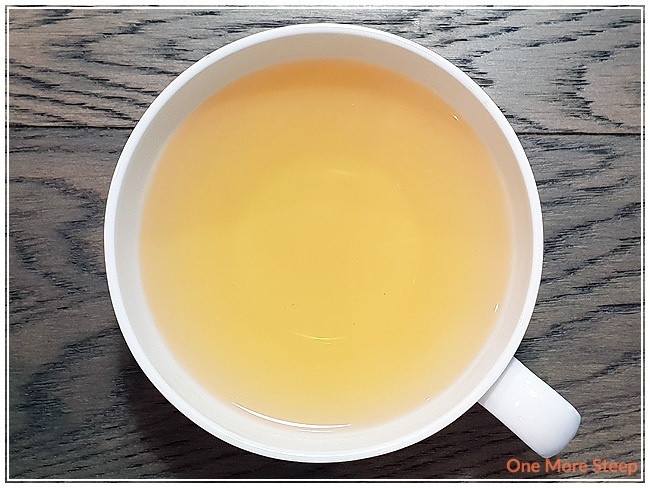 The warming qualities of cinnamon and ginger are quite nice in this oolong blend, so there’s a lot of potential in mixing it up with different dairy products or sweeteners. Masala Chai came to me in a resealable pouch that had all the necessary information on the label – which is always a nice touch. I have friends and family members with food allergies, so it’s always important to me to be able to check at a quick glance what ingredients are present in a tea blend (thankfully nobody has told me so far that they have an allergy to tea yet!). The rich aroma from the dry leaf is primarily that of the spices that are present in the blend. I can mostly smell the cinnamon and the ginger, as those are the strongest fragrances that I can pick out. Masala Chai consists of: black tea, cardamom, ginger root, cloves, natural cinnamon flavour, and cinnamon bark. 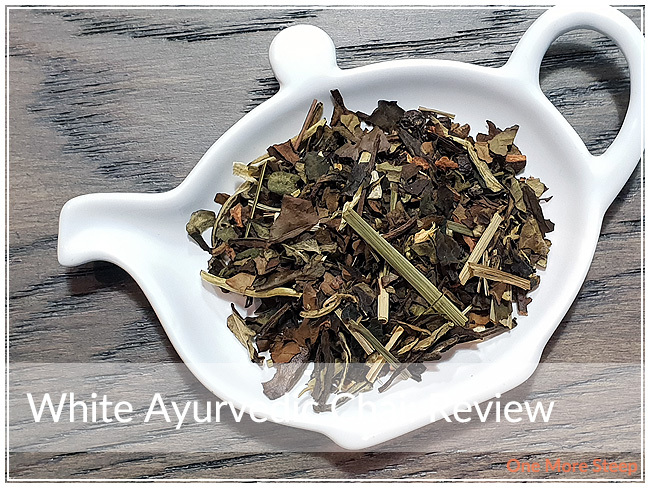 What’s nice is that the ingredients are easy to identify in the blend, there seems to be a fairly even distribution of most of the spices throughout the chai blend. Adagio Teas recommends steeping Masala Chai in 100°C (212°F) water for 7 to 10 minutes. I followed the steeping recommendations and did an initial steep of 10 minutes. 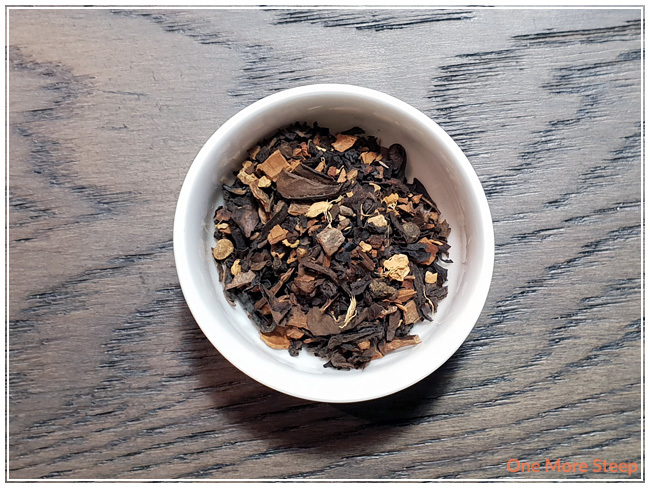 Masala Chai steeps to a golden brown with a rich, spicy fragrance from the chai mix. I can easily taste the cinnamon, ginger, and cloves. There’s a pleasant sweetness in the tea, which balances well with the spicy notes with this black tea blend. 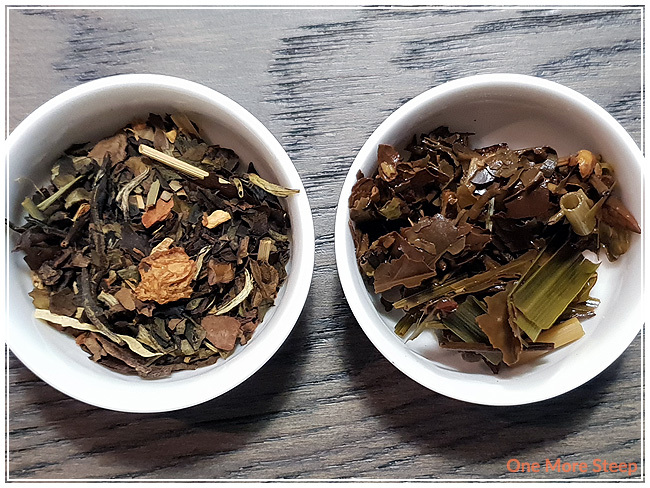 I do find myself searching a bit for the cardamom, which is a flavour that I quite enjoy in chai blends but I also do recognize that it can be easily overpowered by strong spices such as the ginger and cinnamon. I did pour myself a cup of Masala Chai, and added a healthy amount of locally sourced honey as well as some evaporated milk. Like many chai blends, this is a tea that takes to the addition of sweetener and milk or cream well. 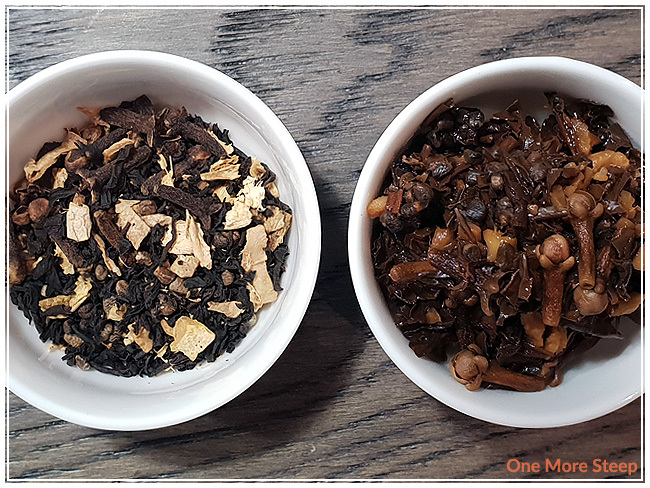 I resteeped Masala Chai twice, adding an additional 30 seconds for each subsequent steep. I found that the first resteep was most similiar to the initial steep – it was a bit watery compared to the initial steep. The second resteep did not fair well, and frankly I did not enjoy it at all. I would say that Masala Chai is good for one more steep. 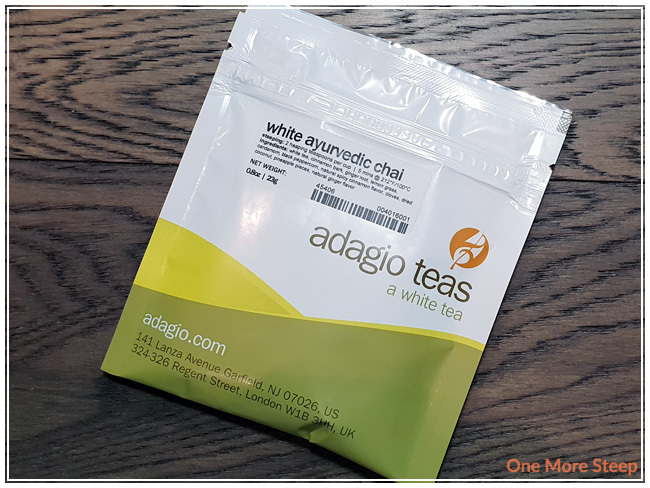 I liked Adagio Teas’ Masala Chai. The flavours of the spices were pleasant, and it did hold it fairly decently to being resteeped. I found myself wishing that the cardamon was more present in the initial steep, and would have liked for it to have a heavier presence in the tea. 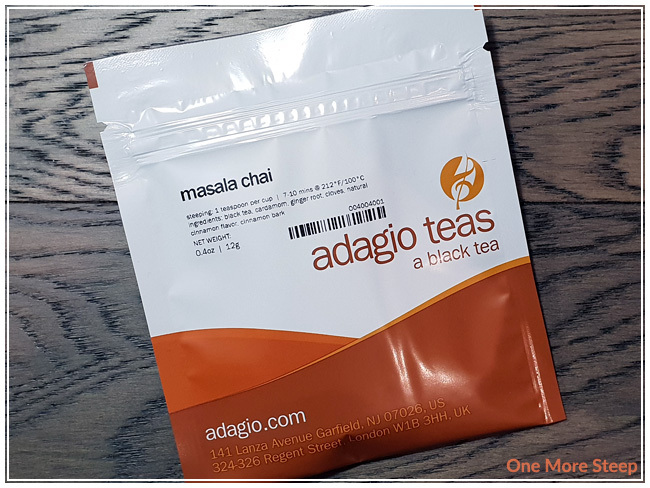 The other spices were well represented in Adagio Teas’ version of Masala Chai, and I found it to make for a nice cup of tea.